Serious Offshore - Simmons Marine, One Heck of a Season!! Octane Racing's Super Vee Lite Team, with driver Jim Simmons and throttle-man Bob Mazikowski, were named 2014 inductees. If you don't think it is hardto get into the APBA Hall of Champions, there is not a better person to discuss this with than Jim himself. In 2010, Jim won the Florida Championship in SBI. He also won the National Championships in OPA, OSS, and SBI that year. Plus, just to make it a clean sweep, he won the World Championships in OPA, OSS, and SBI that year. That final SBI achievement gave him the coveted SBI Triple Crown in 2010. But, even by winning all of those championships, did he win induction into the APBA Hall of Champions in 2010? No, he did not. 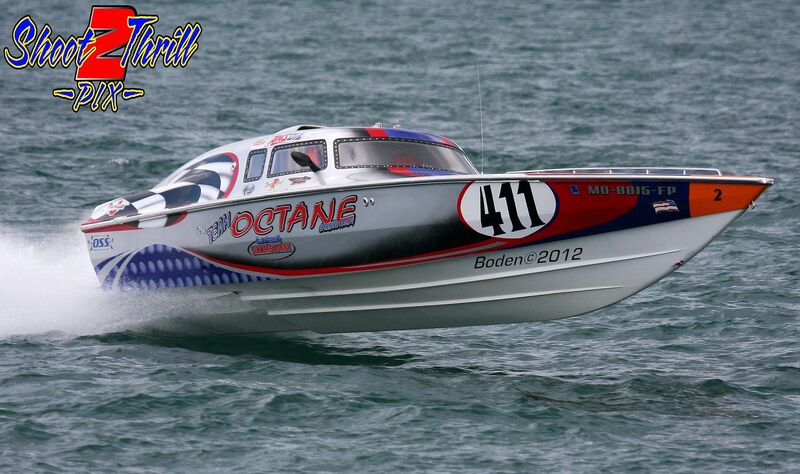 Bob has won numerous championships, including one World Championships in OPA, two World Championships in SBI, and one World Championship in APBA. Plus, just to make things interesting, has won the Offshore APBA Silver Cup in Detroit when it was run in conjunction with the H1 Gold Cup races. Combined, the two of them have 17 World or National Championships and over 100 podium finishes in some of the toughest classes in all of Offshore. Jim and Bob have won their respective class races numerous times in nearly every event of offshore racing. They have driven their separate boats, Simmons Marine and Time Bandit, into numerous wins in almost every organization to come, and sometimes go, in offshore. To say they are anything but true competitors in the sport would be a complete distortion of the actuality that exists. Whether it be P1, SBI, OPA, APBA, or OSS, put on an offshore racing event, and there is a good chance you will have the opportunity to meet these two competitors. So, with that being said, the two combining their talents to compete in offshore should have positive results. And, with an induction into the APBA Hall of Champions, it obviously has. Jim has also won the Randy Linebach Lighthouse award in 2011. The recipient of this perpetual sportsmanship award is selected by a vote of the OSS membership for the racer in any class demonstrating exceptional teamwork, sportsmanship and camaraderie. Both Jim and Bob have their own marine repair facilities. Jim at Simmons Marine in Akron Ohio started in 1984, Bob started Turn Key Marine in Buford Georgia in 1998. With their years of marine repair and performance boat improvements, you would think they would be able to keep a boat running no matter what the problem. Winning induction into the Hall of Champions requires that you make every race with the same boat and crew. It is not an easy thing to do, as every racer knows. Now, when you consider that the Simmons Marine team brings two boats to race at every event. There can be no one, racer or spectator alike, who does not notice when the double-stacked Simmons Racing team pulls into the pits. In addition to their skill in the cockpit of boats moving fast in all kinds of water conditions, Jim and Bob have a flair for engineering, and attempting to improve any craft they have had on the water. Afraid to challenge the status quo on the racecourse does not seem to be part of their personalities. Jim and Bob have a true appreciation for the racers who have come before then to build the heritage of offshore powerboat racing. Now, they join some of those legends in the APBA Hall of Champions and they both look forward to teaching those who will follow them into that legendary body what offshore racing is all about. As racers who have pushed for the re-unification of offshore under the auspices of APBA, there could not be more deserving recipients. Congratulations! The coveted “Godfather Cup” goes to an individual or team that demonstrates goodwill, camaraderie, professionalism and sportsmanship throughout the year. Congratulations Jim. Now, what can they possibly do to top 2014 in 2015? I guess the pressure is on!!! Good picture Pete took back in 2012 with me driving!